Want to make a statement among your peers and that too with a dont-mess-with-me attitude; the Q7 shall do it with ease. 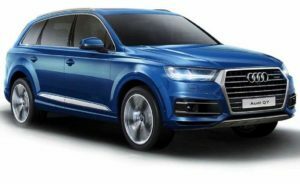 There are some things that you should know or realise before getting the Q7 that it does not only occupy larger parking space but also inflates your ego to maximum.If it’s an Audi, it is all about the unmistakable large mouthed radiator grille and the Q7 too leaves no room of doubt but flaunts it with utter sheen. Wide and at the same time sleek headlights mark the front corners while twin gigantic air guide pockets occupy almost a major part of the bumper. The lower section gets a brushed aluminium finish scuff plate, just in case you take it adventure driving. Also, the upper lip of the air pockets have turn indicator LED strips. I have personally preferred a white Q7 always as a lighter shade highlights every possible contour but this gun metal shade of metallic grey just kept me hooked to it. This particular shade makes it look formal, parked in a plush ambience underneath a corporate vertical and at the same time makes it suit a rugged rocky martian background, exactly how I chose to shoot it. The Sports package has also added 20” 10 spoke alloys, which come in a contrasting bright shade and for once they don’t make me wish it to be black as the stock version looks nice. Just to garnish the profile, it has brighter roof rails.Not that we have a disliking for clean cars but an SUV and especially a core masculine vehicle like this surely carries off some dirt with great style. The rear tail lights feature signature positioning of LEDs. A small change comes in the form of a mildly tweaked rear bumper with scuff plate. The oval exhaust pipes with a chrome finish are nicely scooped inside the rear bumper. This 2016 version of Q7 has an improved cockpit design that is quite arresting. Its dashboard is refurbished and is housed with various new equipments. One of the most significant improvements is the new infotainment system featuring a high resolution touchscreen display. Meanwhile, it is incorporated with ergonomically designed seats, which are well cushioned and covered with Cricket leather upholstery. These are integrated with adjustable head restraints and individual arm rests as well. The front seats have electrically adjusting facility along with memory function that adds to the convenience level. It also comes with a large boot space, which can be increased by folding its rear seat and it comes with rear parcel shelf and trunk room light for easy access. The luggage compartment lid comes with electric opening and closing function. Then it has a 4-spoke, leather wrapped steering wheel with 14 multifunction keys mounted on it. There are also bottle holders present on front and rear doors. It has sun visors with both side illuminated vanity mirrors, which has folding function as well. The cruise control function maintains a steady speed on the highways as set by the driver. There are a couple of drink holders in front center console, while two in rear center arm rest and side panels. Apart from these, it is bestowed with all four power windows with driver side auto down function, automatically dimmed internal rear view mirror, speed limiter, velour floor mats, smoke package, ambient lighting, easy pack tailgate, temperature controlled cup holders and many other such aspects. This model series has several advanced comfort features to ensure a fatigue-free traveling experience. It includes the advanced parking system plus for simplified parking and has an auto hold function that adds to the convenience factor. The advanced four zone deluxe automatic air conditioning unit with rear vents cools the cabin in no time and creates a pleasant ambiance. It electronically regulates the air temperature, rate of air flow and distribution to keep the ambiance pleasant. It also has separate temperature control for driver and front co-passenger and its controls are given on digital display. One of its most important feature is the Drive Select function that aids in adjusting the driving characteristics. Its pre-sense basic helps in networking the different vehicle systems that enables driving situations to be categorized and actions to be implemented for preventing occupants. The MMI radio plus featuring Bluetooth interface, Audi sound system and a 7-inch color display are other highlights. This SUV is also integrated with an advanced cruise control with brake intervention system that maintains the set speed constant, while dealing with obstructions ahead. Another interesting element is the panoramic glass sunroof that can be electrically operated. Besides these, it also has electrical sun blind for rear windscreen, driver information system, front center arm rest, electric luggage compartment cover, Audi phone box, and various storage compartments. All these features put together make it one of the most comfortable vehicle in its segment. The ride of the Q7 is plaint. It glides over potholes with ease and without filtering any of the road shocks into the vehicle. It feels a bit unsettled on bad roads at high speeds, and now I’m knit-picking. The handling is good, despite its dimensions. It is easy to drive but you do feel the size when driving in the city. Now, to buy or not? The Q7 looks fresh, stylish and we loved the way it drives, and even the space it offers. The Q7 is certainly a lot better than the previous gen and certainly worth procuring. One of the best in ride and handling and features too. Audi has worked on the Q7, but the new generation feels more like a station wagon than an SUV/crossover. The dimensions haven’t shrunk, it is more of the design. But in terms of technology, this one has improved by miles. The new Q7 does stand out and it feels a lot more stylish too. As expected from the four ringed badge, the Audi Q7 is loaded with safety features including eight airbags, ABS, ASR, EDL, ESC, Hill Descent Control and more such electronics. Audi has a good reach across the country with a wide network for a German luxury carmaker and it is further growing at a good rate. However, the cost of ownership and maintenance is not too light on the pocket since most of the parts are imported and if something goes wrong with the car, it takes a while at the workshop to replace/repair compared to the mass market carmakers in India. So to wrap up everything the Q7 definitely now is at par with its other competitors, it has shed lot of weight and now even has become more fuel efficient. For those who hated the bulky looks should definitely love the new and improved sharp looks of the new Q7. Inside too you get a new center console with lesser buttons which not only has made handling the MMI interface easier but kept the center console as well the dashboard clean. Under the hood you even get new engine options and moreover Audi too will add the e-tron variant soon to the lineup.The Q7 definitely has improved a lot compared to its predecessor and you definitely can get your hands on one.